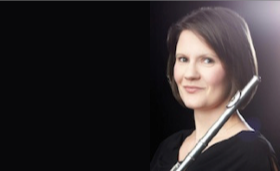 Stephanie Rea has taught flute and music theory at Murray since 2000, receiving the university’s Presidential Fellowship in 2004 and the Center for Teaching, Learning and Technology’s Teaching Innovation Faculty Fellowship in 2010. Dr. Rea was awarded a Fulbright in 2009 for teaching and research in Frankfurt, Germany and has since served as a Peer Reviewer of Fulbright applicants in music. She is a published author with a compact disc to her credit (centaurrecords.com) and has served as an officer and committee member in many professional organizations. Dr. Rea has performed and taught across the U.S. and around the world. She regularly performs with the Paducah Symphony Orchestra and as a soloist and chamber musician in a variety of capacities and venues. What advice do you have to upcoming flutists who have hopes of landing a higher education job? It is more competitive than you can imagine. I’ve served on many search committees, and there are usually upwards of 100 applicants for our tenure track positions at Murray State University. We are a regional institution with approximately 200 music majors, 40 music minors, and many musicians who do not major or minor in music, but participate in our ensembles, allowing us to have many fine chamber groups, two jazz ensembles, two concert bands, and an orchestra. To rise to the top of the applicant pool here, people almost always have a completed doctorate, have excelled in one or more areas, and have teaching experience. This is, of course, in addition to being a top-notch and experienced performing musician. So, it is of utmost importance that in preparation for a career in higher ed, a person get a foot in the door somewhere and start teaching. I did this with four years as a graduate assistant at Florida State University (teaching both flute and aural skills courses – I did a second M.M. in music theory), as well as with one year as an adjunct instructor at Columbus State University in Georgia. Grab on to any teaching experience you can start with, and try to add from there. Offer to teach more courses than what are asked of you. Go above and beyond in every way you are able. It is incredibly rare to land a tenure-track teaching position without having a record of success in teaching. While this can include various summer camps, private studio, and pre-college music schools, nothing will take the place of teaching at a university, so aim for that while training. Secondly, I’d recommend gathering a few serious mentors during your graduate school years. Your flute professor must be someone you can rely on to go to bat for you, someone interested in helping you find work. Find other professors who are willing to do the same. You will do this best by maintaining as professional as possible an attitude in everything that you do, and making sure you show the right people what you are capable of. Meet with these people and ask regularly: what do you think I should be working on in the next year in terms of building my resume? You don’t have to do everything that people say, but that information can be very valuable. Tell us about your Fulbright Grant to Germany — what was your research, and how did you you come about this topic? I was a Fulbright Senior Scholar teaching and researching at the Hochshcule fuer Musik und Darstellende Kunst in Frankfurt am Main in 2009. I didn’t feel particularly “senior”, but having already earned tenure put me in that category for the award. In Germany, I taught supplementary flute lessons and a teeny bit of chamber music coaching. One of my goals was to live and work in another culture, and I chose Germany mainly because of my love German language and culture. It’s rich tradition of classical music was, of course, a draw. My research was pedagogically based. I wanted to find out just how Germany trains its music students. The short version is that I learned that there’s more than one way to skin a cat, (I guess I already knew that), and that regardless of the exact curriculum, we’re all getting at much the same thing. There are more similarities than differences. I do think we are much busier in the U.S., and I don’t think that is a good thing. Has there been any one teacher, idea, or method that has changed your life? Every flute teacher I’ve had has changed my life in some ways. I started playing piano at age 6, flute at age 9 in public school in Pennsylvania, then moved to Tennessee where I continued in band and youth orchestra soon after. At age 13, I began private lessons with Rebecca Paluzzi at East Tennessee State University and went to university there because she was a great teacher and I earned enough scholarships to cover tuition, room, board and have some money left over. I played 2nd flute to Mrs. Paluzzi for four years in the Johnson City Symphony Orchestra – great training for that age. Having lessons with her for 8 years put me closely in touch with all things Suzuki Method. I never did the Suzuki teacher training, but I did go to Matsumoto, Japan twice (for a month in high school and a month in my undergraduate years). The Suzuki influence really reinforced attention to the rudiments of great flute playing: tone, phrasing, and musical expression. My teacher in Japan, Toshio Takahashi, was someone I had a few lessons with over the years in the U.S., mainly in master classes at the East Tennessee State Suzuki Institute in the summers. His teaching is definitely a big influence on me, both first-hand and through Rebecca Paluzzi. He and the Suzuki Flute Method were my doctoral treatise (dissertation) topic at Florida State University. Because I stayed at Florida State University for both M.M. and D.M., the late Charles DeLaney was my teacher for four years, and a wonderful influence on my life. I admired his dedication, his tireless attention to detail, and all that he had accomplished in his career as a performer, composer, conductor, and teacher. He was a class act – a really wonderful human being, and I quote him frequently in lessons still today. Any projects for the near future? Keeping my head above water! I play regularly with the Paducah Symphony Orchestra, which has become an absolute first-rate regional orchestra. What that group does in 3 rehearsals, is nothing short of amazing. I get to play absolutely amazing repertoire with great musicians, a great conductor (who is nice!!). My husband, trumpeter Kurt Gorman, being in the group is an added bonus. Playing as many concerts as I can during the season and teaching full time is no small feat. With two young kids, it’s hard to have any other projects, but I do a solo recital (or two) every year. Last year I performed a recital of winter-themed music with winter-themed poetry read in between each piece. I love collaborating with others, be they musicians, scholars, artists, dancers, poets…..so perhaps my recital next fall will include some of that. After performing as much as I have, a flute recital of nothing but flute music doesn’t excite me in the same way it once did. I crave a little variety, so collaborations are my means to create some variety in the programming. On being a parent: Any advice to young professionals who want to have a music career AND be a parent? I’m not sure I have any advice for others, as all kids are different, and you never know what you’re going to get! I can tell you that it is incredibly hard. I have a lot of advice that I would give myself if I could write a letter to myself before I’d had my children – hindsight is 20/20. Being a full-time working parent, especially a mother, is incredibly challenging. I can’t fathom single parenthood. It is not possible to do all the performing and traveling that I used to do, and it isn’t easy to come to terms with that sometimes. I’m so rarely at my best, because there are so many more demands on my time. The pace of life one keeps when they have no children is not possible to keep when you have children. At least that’s my experience so far, having a six-year-old and an eight-year-old. Having children will likely challenge you in ways you never expected, and I’m not sure how much planning one can really do to prepare for any of that. You are no longer the star of your own show when you have kids. And for a performing artist, that’s an adjustment. We aren’t used to sacrificing ourselves for much of anything other than our art because it takes so much sacrifice in order to become a classical musician. But parenting is a wonderful, scary, exhilarating, painful, beautiful, difficult, moving, joyful and momentous experience. It’s like life on steroids! I consider myself lucky. Great interview!! Thanks Flute Examiner for publishing it. Stephanie, I am really impressed with all you do and how your career has progressed. It is also nice to see how you were able to succeed and go on to be a professional player and university teacher having grown up in a non-metropolitan area and done your undergraduate study in a smaller university. You certainly took advantage of all the opportunities available. As a retired university music professor and administrator who also has been on many, many search committees, I also applaud your excellent advice on how to prepare for and attain a teaching position in a college. It is very competitive, but those who are willing to work hard, have persistence, and follow all the steps you recommend will have the best chance of winning a job. I concur with your comments about the late Charlie Delaney. He was really special as a teacher, musician and friend. You are a wonderful flutist. I love your CD and hope you do another. Thanks for this informative interview. Thank you so, so much. Your comments came at a perfect time for me. And coming from such and experienced professional like yourself, they mean that much more. My very best to you!